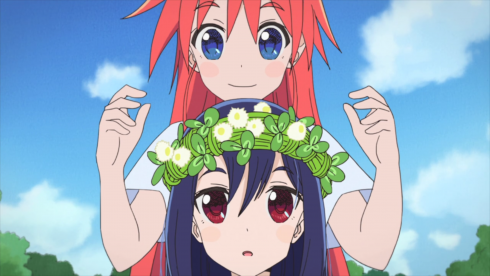 In between tense character beats and mad science warfare, Flip Flappers also threw a number of reveals and explanations at us. 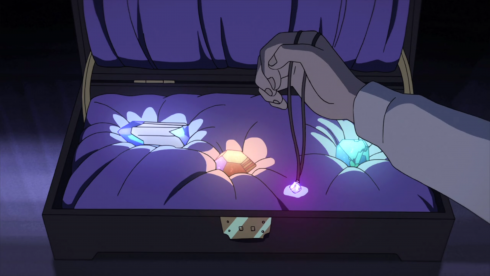 Most of them had been foreshadowed well enough that they didn’t come as a surprise, exactly, but it was still good to get confirmation. 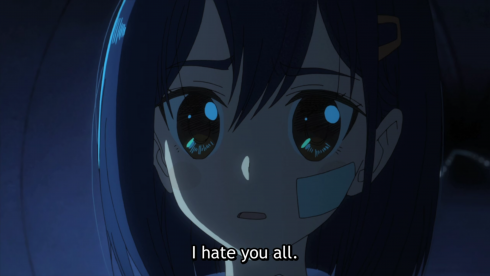 It was especially important to see how Cocona would react to all this new information about Asclepius, about Mimi, and especially about herself and the people closest to her. 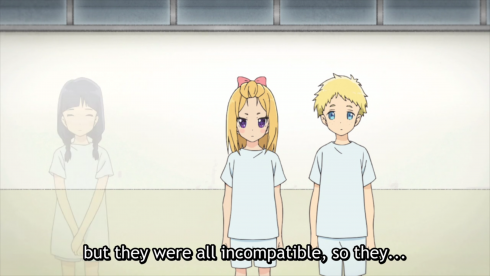 First Yayaka, now branded a traitor, opens up to Cocona about Asclepius’s goals: They plan to rule Pure Illusion and use it to control reality itself. 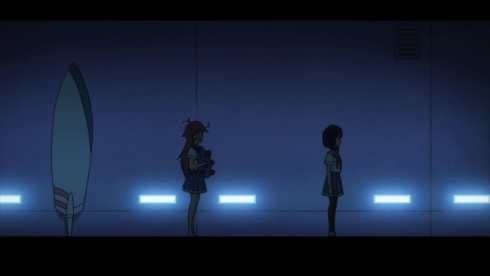 Choice/Freedom and Obedience/Control have always been opposing forces in Flip Flappers, and now we’re seeing that conflict bleed out from Cocona’s internal conflicts and into the world (and story) at large. 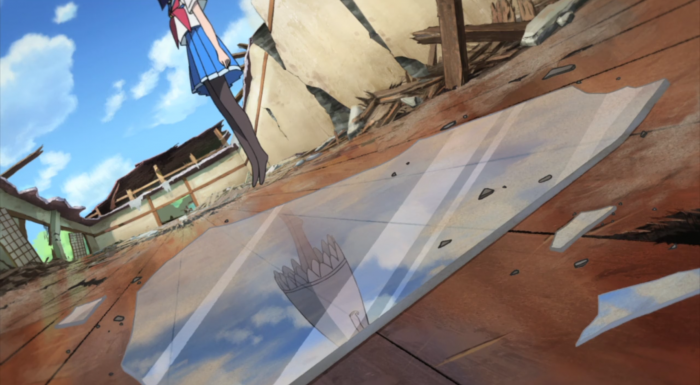 Both Asclepius’s leader and Dr. Salt spoke of “liberation” in respect to Pure Illusion, but Yayaka’s explanation suggests that, while Salt said he wants to “liberate” Pure Illusion itself, Ascelpius seems more interested in “liberating” reality from its current laws. 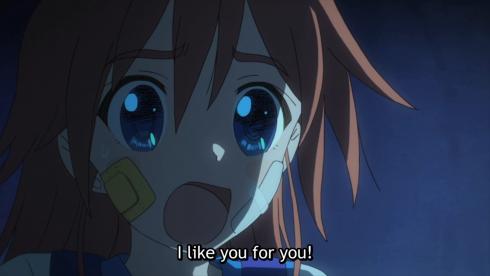 This isn’t the wish-granting power Cocona had hoped for, but Flip Flappers doesn’t deny the allure of this brave new world. 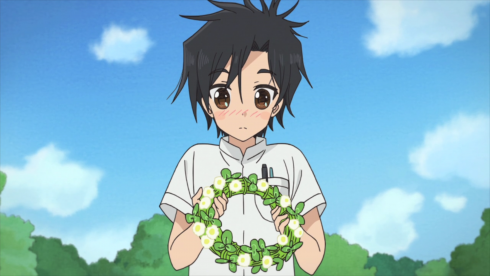 Yayaka admits that she “believed in” Asclepius’s goals because she wanted to create a world where no one would get hurt–a world where everyone would have a place to belong. “If choosing my rightful place meant losing it, I thought I’d be much happier letting someone make the choice for me,” she admits, beautifully summarizing the options in front of them. Do they pick freedom and risk, or servitude and safety? It’s not nearly as easy as it sounds, especially if you’re a lonely kid. Yayaka’s explanation also lays the foundation for Papika’s story, as we’re taken from one stark lab performing life-threatening experiments on kids to another one several years prior. Here, scientists are trying to find a partner for Mimi, a girl who can travel to Pure Illusion but who never lowers her impedance and synchronizes with anyone…until Papikana marches cheerfully into her room, anyway. 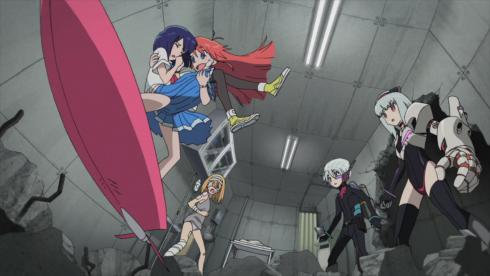 There are still some gaps in our backstory, especially about how Mimi wound up as fragments/amorphous and how Cocona got the amorphous “implanted” in her. (While it makes for a great visual metaphor–kids carrying fragments of their parents inside them ‘n’ all–I’m hopeful for an in-story explanation, too.) 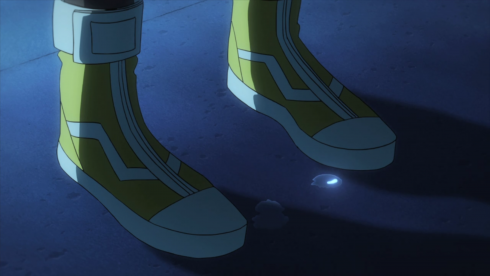 I’m hesitant to assume too much since Flip Flappers will probably fill in the blanks in the next couple weeks and then we’ll all get to laugh about how wrong my theories were. 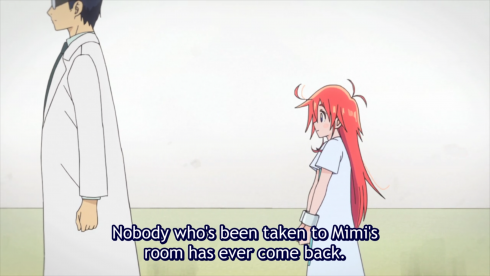 That said, I do think we can connect a few dots and say that Asclepius and FlipFlap were both founded by members of the organization that studied Mimi and Papika(na). 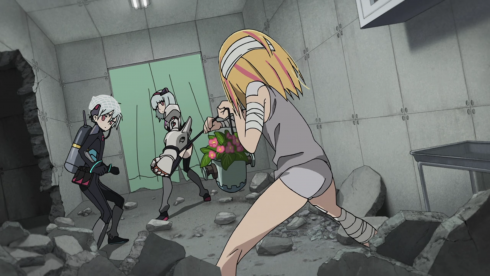 Asclepius’s stark white rooms and penchant for child experimentation seem to be more in line with the original organization, while FlipFlap’s merry band of mad scientists is more akin to a rebel splinter group. Even if Salt has “gotten meaner,” his team has shown enough kindness (especially to “the enemy” Yayaka) that I feel pretty comfortable saying they’re not Secretly Evil, even if they’re not exactly Lawful Good, either. 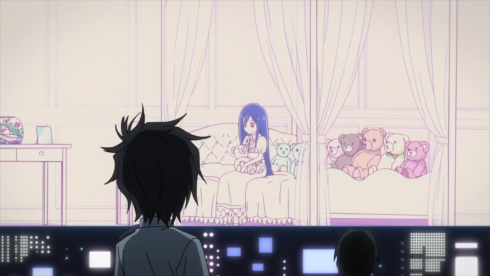 It’s also safe to assume that Mimi and Salt are Cocona’s parents, and that something happened to Papika to either keep her from aging at all or reverted her back to childhood. (And no, I’m not super comfortable with this development, since we’re now dealing with a, er, not unproblematic age gap between Cocona and Papika…but I still ‘ship ’em, dangit, so I’ll withhold judgment until we hear the full story.) Beyond that? I think a lot is still up for debate. More vital than the plot reverberations, though, is how these reveals impact Cocona and her personal reality. Her path to self-actualization has hit a rocky stretch this week, to say the least, given that she learns the three most important people in her life have all (seemingly) been using or lying to her, more interested in what she represents than who she actually is. Yayaka and Grandma were both Asclepius agents monitoring her because of the amorphous implanted in her, and Papika was initially attracted to her because of her connection to Mimi. Granted, we at home know Yayaka and Papika genuinely care for Cocona, but that’s not how it looks to Cocona. She sees herself as a thing people want to control (Asclepius very literally objectifies her, a quietly powerful comment about female adolescence in and of itself) or as an interchangeable “substitute” for a previous partner. She’s a “rebound girlfriend,” a choice made out of convenience instead of affection. “Anyone would have done,” she says, no longer certain of her place in the world and in the lives of the people she loves. 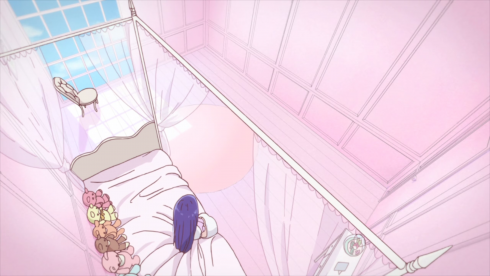 Cocona has hit that stretch of adolescence where she’s learning a little too much about the people around her and beginning to realize that they not only have their own complex internal worlds, but their relationship to her may not be what she wants it to be. Often the last 9 episodes, she’d found a path for herself and people she wanted to protect. Now she’s not sure if that path is really hers at all. And how frighteningly perfect that this identity crisis culminates with Cocona literally “becoming her mother,” her individuality subsumed by a parent’s desires and wishes. ‘Cause if that ain’t one of the great anxieties of adolescence, I don’t know what is. 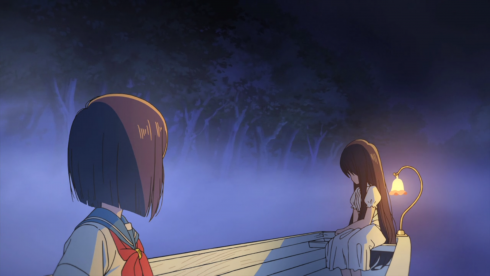 For all its edges of darkness, there’s a fundamentally upbeat tone to Flip Flappers that’s kept me confident we’re moving towards a happy ending. But I gotta be honest, the way this one ended? It has me a little worried. 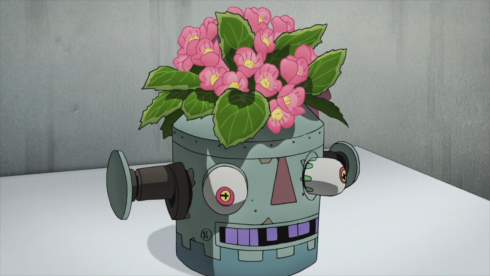 The leaky robot vase supplied by Hidaka and Sayuri was adorable and perfect. We know very little about those two, but I kinda love them. Can we all agree that the “faking being disabled” trope is harmful and bad? We can? Swell. “Jitter,” when applied to electronic signals or devices, refers to a deviation from regular functions, sometimes caused by interference, that can lead to flickers (visual), clicks (audio), or losses of transmitted data. I love Flip Flappers’s episodes titles, partly ’cause they’re spot-on and partly ’cause they’re teaching me a bunch of neat things about electronic signals! Don’t let anyone ever tell you anime isn’t educational. Pure Speculation: Now that we know the amorphous are all fragments of Mimi, this puts a curious spin on our past trips to Pure Illusion. Did Mimi have a hand in influencing the worlds the girls traveled to? Did we learn about her personality and memories in addition to the others adventurers? 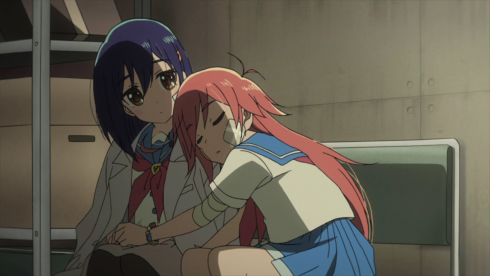 And what does it say about Mimi that Pure Illusion so often tried to seduce Cocona and Papika to stay forever, or that every time they tried to “liberate” a fragment, the fragment fought back to the point of nearly killing them? Did Mimi even want to be rescued?